Why should we monitor snow leopards or their prey species? Snow leopard populations are extremely difficult to estimate or monitor over time. Attempts at counting them are greatly hampered by their shyness, nocturnal or crepuscular activity pattern, wide-ranging movements and naturally low densities. Studying an elusive species like the snow leopard requires patience and a trained field biologist or park ranger employing special techniques. There are five different methods, each differing in terms of complexity, cost, requirement and information generated. Conservationists are more successful in protecting an endangered species if they have reliable information on where the animal occurs, which areas contain the best numbers and which populations are most at risk from poaching, habitat change or other factors. Status and distribution surveys better enable conservation organizations to target key areas, or design and evaluate cost-effective programs. Monitoring plays a vital role in verifying changes to the snow leopard population after a conservation program has been initiated. 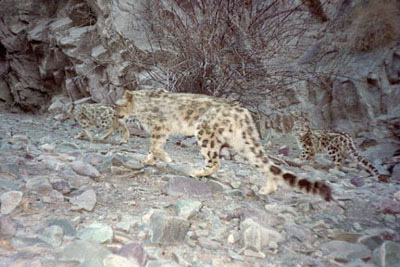 Increased snow leopard or prey numbers and a more accepting local human population are important indicators that the program is achieving its intended goal and objectives.